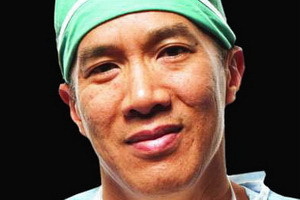 Charismatic and controversial, groundbreaking neurosurgeon Charles Teo launched the Cure for Life Foundation in 2003, with an ambition to raise $1 million in the first year and millions more in future. His long-term goal is to find a genetic molecular explanation - and cure - for brain tumours. Already he has set up a tumour bank, with the aim of growing cells, looking at how to modify the genes in those cells and ways to develop agents to kill them. Although evidence is mixed, he believes electromagnetic radiation is probably a factor in the development of brain cancer. Meanwhile, Teo, director of the Centre for Minimally Invasive Neurosurgery at Prince of Wales, has a growing international reputation for doing radical surgery on tumours that other neurosurgeons consider inoperable. Patients come to him from all over Australia, New Zealand, the United States, Britain, South-East Asia and many other countries. Features: A story about Teo and one of his patients, the young pianist Aaron McMillan, is detailed in the book Life in his Hands by Susan Wyndham. A patient of Charlie Teo's, Sally White, has written of her experiences in Three Quotes From A Plumber: How a Second Opinion Changed the Life of a Woman with a Brain Tumour. Teo has also been featured in several TV programs including the ABC's Q&A, Good Medicine, 60 Minutes, Last Chance Surgery, Australian Story and Enough Rope. Presentation: Teo gave the 50th Anniversary Errol Solomon Meyers Memorial Lecture at the University of Queensland in August 2007 and the 2012 Australia Day speech. Education: Teo chose pediatric neurosurgery because it was 'the most taxing specialty' and 'I knew you could be a pioneer in neurosurgery'. After training in Sydney, he spent a decade working in Texas and Arkansas. There he refined his use of endoscopy to operate on the brain through a small hole in the skull, helped develop improved instruments and began teaching doctors. He now runs six courses a year in the US. Recognition: Teo was a runner-up in the 2003 NSW Australian of the Year for his pioneering work and patient advocacy. However, Australian surgeons have been slow to take up his techniques since his return four years ago. He's also a dedicated father to four young daughters with his Perth-born wife, Genevieve. To stay fit for long operations, he kayaks, cycles and does not drink coffee. He lives by Buddhist principles and his mother's ethical code that 'you should treat everyone as though they're a member of your family'. Behaviour: Teo operates to music by John Denver, Elvis or Abba. Unlike his more formal colleagues, he calls patients by their first names and invites them to do the same. He throws his arms around them, supports their personal religious beliefs, advises on diet and meditation, and sometimes takes them home for dinner. He warns them of the worst possible outcomes but encourages them to be optimistic. "We can lick gravity, but sometimes the paperwork is overwhelming."